DiGi may be busy preparing stuffs for its postpaid customers with the introduction of 4G LTE for its postpaid voice plans and new SmartPlans, but that doesn’t mean it’s forgetting its prepaid subscribers. At the launch this morning, the telco also introduced some new weekly mobile internet for its prepaid subscribers that are as affordable as RM3/week – Weekly RM3, Weekly RM5 and Weekly RM7. Weekly RM3 does not come with any data but it still gives unlimited messaging on WhatsApp and WeChat, as well as unlimited surfing via Opera Mini browser at regular speed. 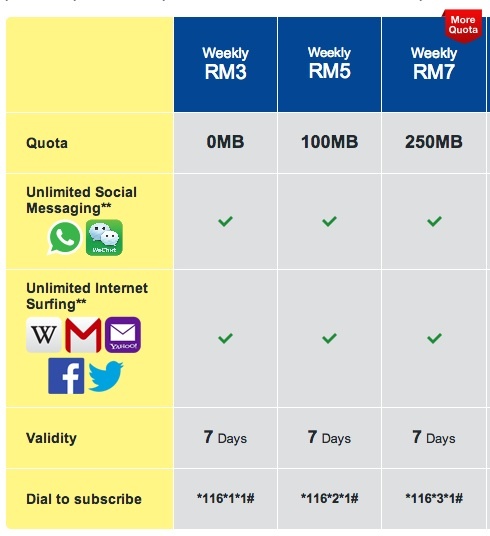 As for the other two, Weekly RM5 and Weekly RM7, you will have up to 250MB of data for you to use but if you run out on that, you will still be able to use the free “unlimited” stuffs that are bundled together – Unlimited messaging on WhatsApp and WeChat, and unlimited surfing using Opera Mini browser. After you receive your confirmation SMS, you may browse and chat away.